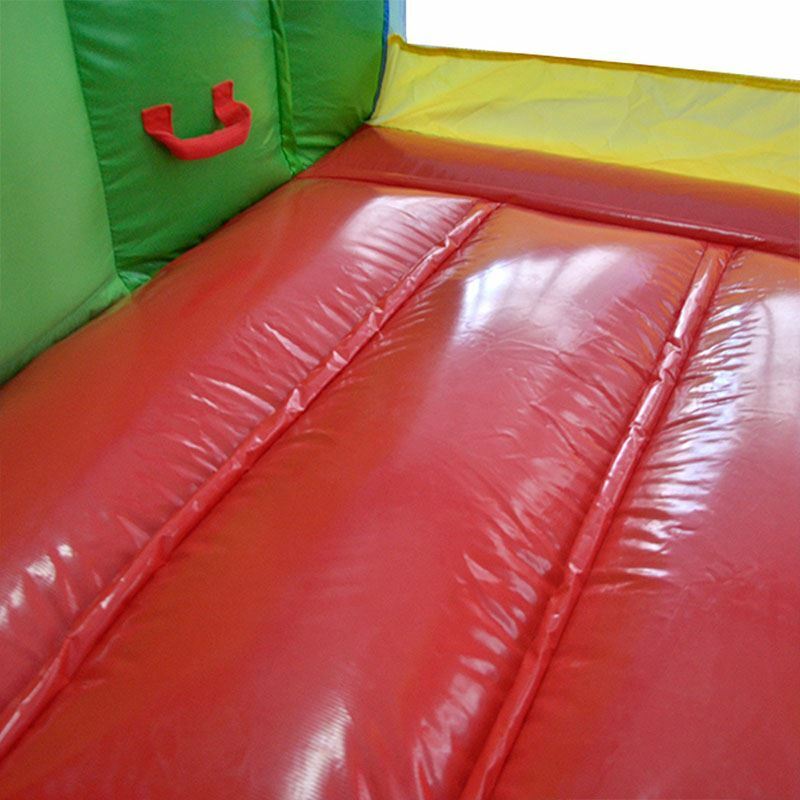 We use PVC tarpaulin material for bouncing floor, slide surface, climbing wall or other main parts of products to make sure the inflatable bouncer is really strong and can be used for a long time. Other parts are made of 420D or Nylon coated PVC, which is better and stronger than other brands in market. Other brands' inflatable castle use few even no PVC. 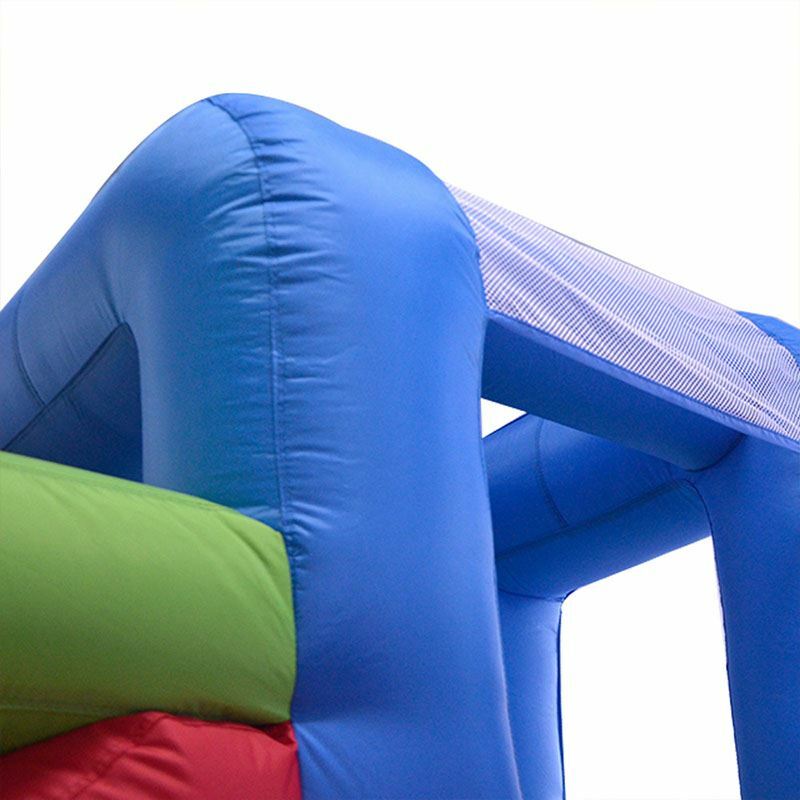 We guarantee you won't find a better quality bouncy castle at a lower price! Applications: Used in house, backyard, family birthday party, etc. Package: Inflatable Bouncy Castle, blower and accessories are packed into a carton. 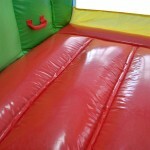 Why choose Inflatable Jumping Castle? 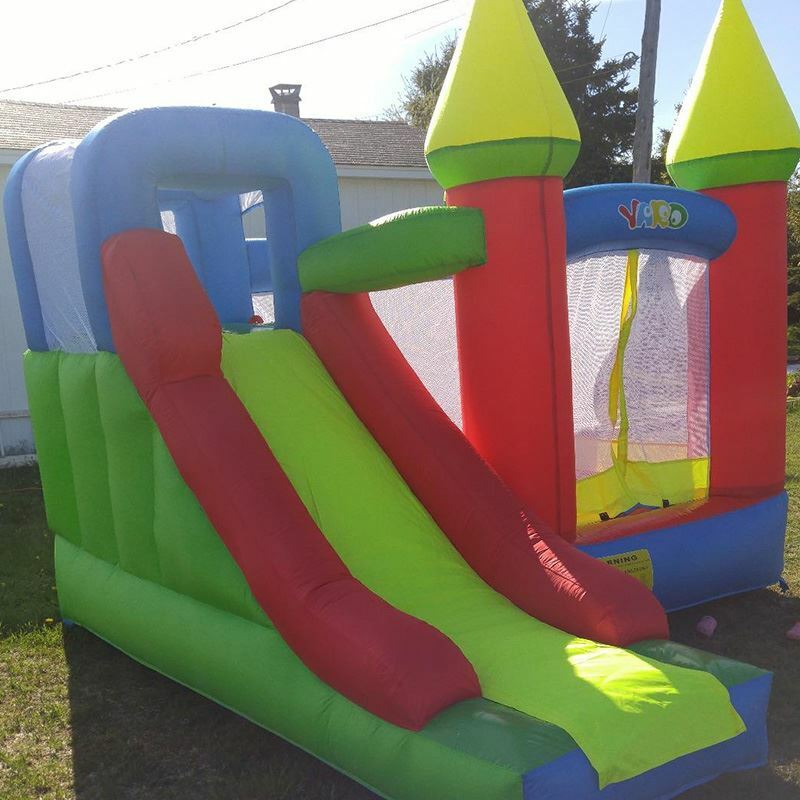 Numerous studies have shown that inflatable children jumping game is beneficial to the child's physical and mental development. It can satisfy children's curiosity about the world, strengthen children'sense of team and exercise children’ bones. 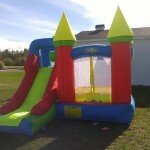 Inflatable slide and bouncer have become indispensable in the growth of children. 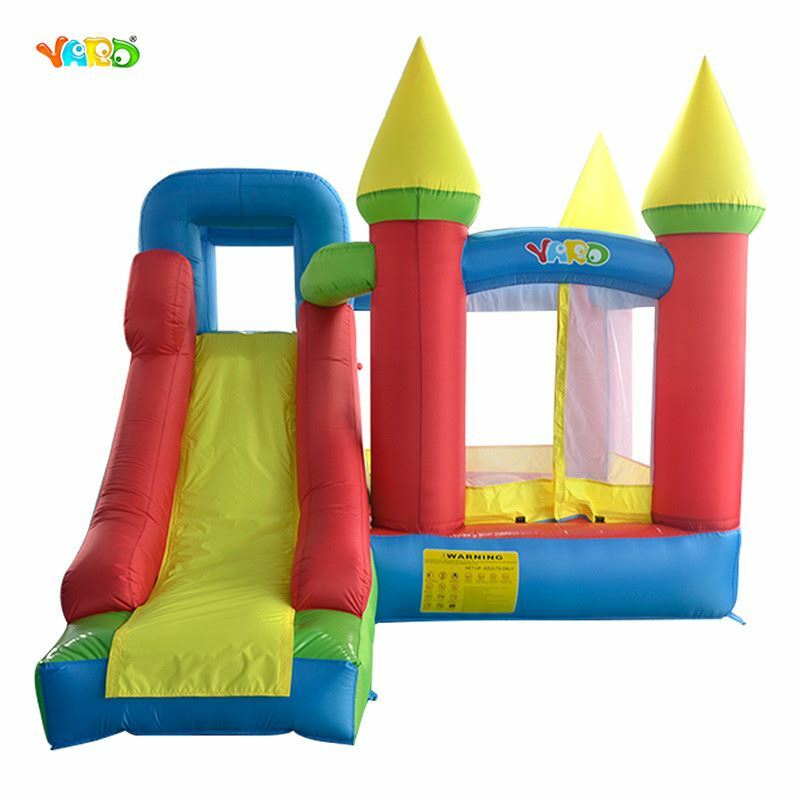 How to protect Inflatable Jumping Castle? 1)Take off the shoes and all sharp items before playing. Overweight is prohibitive. 2) Do not move the product, if the ground dragging a long time, it is easy to frayed. 3) Keep it away from fire and do not use it under extreme weather, avoiding accidents. 4) If don't use it for a long time, please package it well. 5) In the same time, pay attention to rodent control insects. 1) Do not push and do other kinds of dangerous actions. 2) Do not chasing in the bounce house, which will harm others. 3) Do not use hand to grasp the net. 5) Safety first, children should play under adult's supervision. 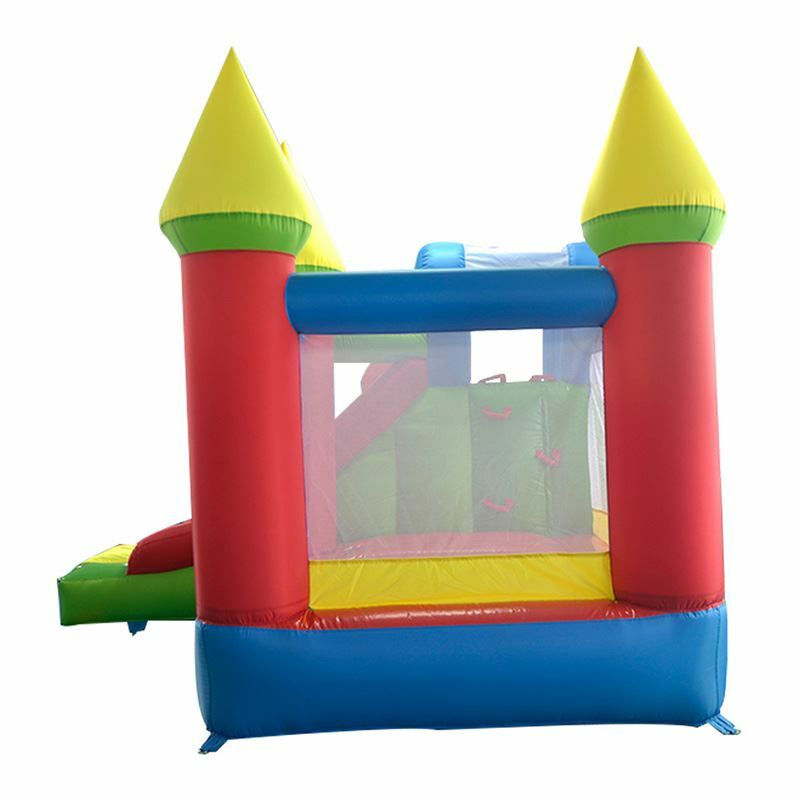 Although it is not for commercial, residential bouncing castles are made of strong material and use the same style sewing as commercial. It is very durable as long as you know how to maintain it. Please read the following FAQ. That would be esay shopping! Q1: How about the blower? Is it matched with voltage and plugs we use in our country? A. Because different countries are using different plugs and voltage. In order to send the right blower for you, please kindly tell us what standard of plugs and voltage you use when you place order. Generally, there are European, American, British, Australian, Philippines, Korean standard. If you don't know about that, you could send pictures of your plugs, we will send it for you accordingly. Q2: What is the CUSTOM CLEARANCE? Why I need pay the IMPORT TAXES? A: Clearance operation is the product you buy an import program, under the laws of the local country customs regulations. Pay certain import tariffs, by different rules and local customs value of different products to collect. Buyer should pay the customs tariff to local custom directly. Kindly note that customs taxes is paid to your local customs, not to us and Express, it is your responsibility for your country. Q3: What is included for FREE SHIPPING? Do we need to pay additional IMPROT DUTIES? A: It only contains the price of goods and shipping for FREE SHIPPING. The customs in your own country is responsible for import duties. So you should pay the tax to the local country, not to us. Q4: Can you help me to declare very low value? We can pay less tax in this case. A:Yes, we are glad to help you to save some money and will reduce the amount of reporting appropriately. But the value can’t be too low, which may lead to inspection of goods and detention of cargo. It is an advance statement that we don't take any responsibility for this. Q5: How can I know which products are in stock? A: Please check with our customer service staff before your order. Because we have our own factory, limited stock and hot sell. Q6: Why does YARD only accept DHL and PEDEX? Can I choose EMS, CHINA POST AIR MAIL or other cheaper freight? A: Sorry, it is a rule that CHINA POST AIR MAIL only support the package under 2KG and EMS only accept one-piece below 25 KG. However, the weight of our products is more than 20KG per piece. Q7: Why not use DHL EXPRESS to RUSSIA? A: Because customs clearance in Russia is so complex that it may easily lead to clearance unsuccessful or returned goods. Please contact us for details. We have some stock in Russian warehous. Q8: The real arrival time and the time YARD told us is not same, why? A: The time is announced by the courier company and there are many factors affecting it. Such as row warehouse, weather, customs clearance, etc. Q9: What are accessories included? They contain PE BALLS? A: They include blower, ground stakes pack, carrying bag, repair kit and instructions, (water tubes for water slides. You need to pay additional cost of PE BALL and NET BAGS. 1. Customers from BRAZIL, leave your V.A.T number with your order. 2. Make sure all information be correct, including address, telephone, full name (especially Russia) and zip code. 3. Because the inflatable castles are made by sewing, small air leakage are normal, not problem of quality. Do not try to repair! 4. GLUE can not be shipped by air or express, so there is not glue in repair kit,please understand it. 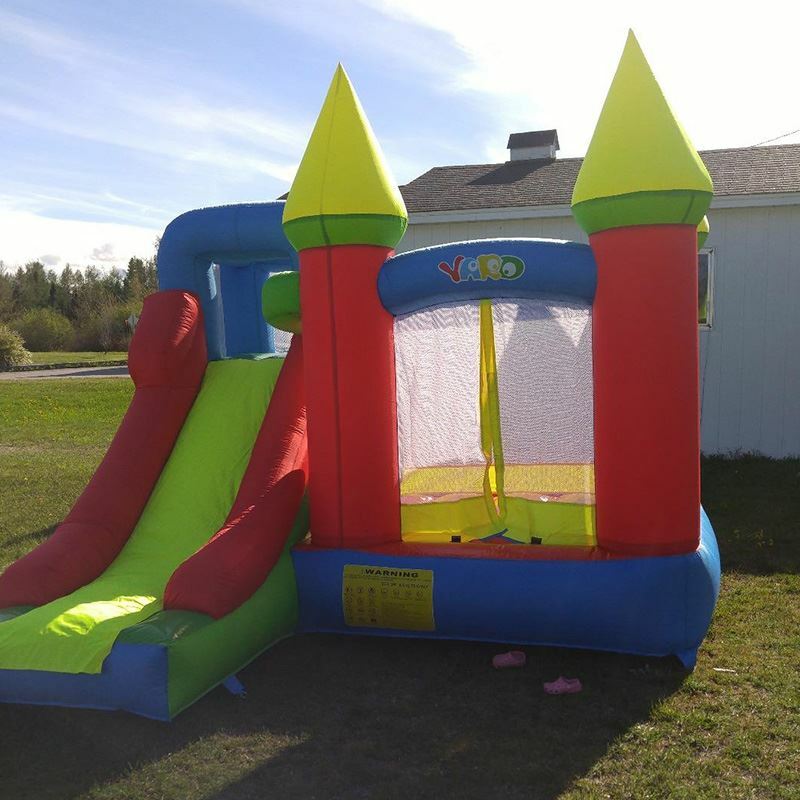 5.When the product arrives your country, please contact Express company, work well with them to do CUSTOM CLEARANCE and pay the IMPORT TAXES quickly, in order to get the inflatable trampoline fast and smoothly. 6. Buyer affords all lose from destroy and return because of Customs Clearance delayed. 7. If any questions of product and after-sale service, even complaints, please contact our staff firstly before your negative feedback. We will do our best to solve them for you.